Aloha from 1102 Waikoloa Colony Villa! 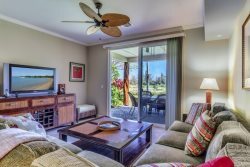 This tropical paradise 2-story condo is located on the 10th fairway of the picturesque Waikoloa Beach Golf Course. A tremendous retreat for a small family or three couples, this impeccable home sleeps up to eight guests and features three bedrooms, and two full plus one half bathrooms. The main gathering area or living room with its magnificent wall of windows warmly welcomes guests to enter, sit down and take in the beautiful view of the tropical paradise that lies before them. The fully-stocked kitchen is open and inviting, and offers high-end appliances, and all the cookware to help create a delicious meal. The dining room seats six with additional seating at the breakfast bar. Enjoy a beautiful sunset on your lanai which boasts a large green space for you to enjoy or simply sit and watch the golfers perfect their shots down the fairway. The beautiful colors and décor of this unit is calming and truly represents the ultimate Hawaiian experience from the artwork to the furniture. The master suite is located on the upper level where there is an additional lanai with amazing views of the gorgeous landscaped golf course. The master is decorated with a Tommy Bahama duvet in classic Hawaiian Bird of Paradise design, with high quality bedding and luxurious bath towels. The king bed has a memory foam topper to help you sleep like a dream as the Hawaiian breezes remind you that you are in paradise. The master bath provides a soaker tub and standing shower as well as double vanity. Each of the queen and twin bedrooms are also outfitted with high quality bedding and done in tasteful colors that bring the island feel to mind. There is also an additional full bathroom on the second level with new luxurious bath linens. There is a laundry closet with a full-size washer and dryer as well. Enjoy an unbeatable awe-inspiring view of the beautiful gardens and manicured lawns with a large swimming pool and hot tub while relaxing and reconnecting with family and friends. When you are ready for some adventure or exercise on one of the beautiful beaches, the garage is outfitted with brand new boogie boards, new beach chairs, coolers and grass beach mats along with brand new beach towels. There are also brand-new tennis rackets for your use at the tennis court located close to the building. If you don’t feel like using one of the Hilton pools, you are in luck, as steps from your front door is a large resort style pool and hot tub as well as the weight and cardio rooms. There is a second pool in the complex as well. BBQ grills are also very close by.